Quentin Jacobsen - Q to his friends - is eighteen and has always loved the edgy Margo Roth Spiegelman. As children they’d discovered a dead body together. Now at high school, Q’s nerdy while Margo is uber-cool. One night, Q is basking in the predictable boringness of his life when Margo, dressed as a ninja, persuades him to participate in several hours of mayhem. Then she vanishes. While her family shrugs off this latest disappearance, Q follows Margo’s string of elaborate clues - including a poem about death. Q’s friends, Radar, Ben and Lacey, help with the search, and a post turns up on a website: Margo will be in a certain location for the next 24 hours only. The race is on! After an epic drive through the night, they catch up a with Margo, and Q learns first-hand that the way you think about a person isn’t the way they actually are. When Margo Roth Spiegelman, the über-cool and very beautiful queen of school and town, chose Quentin, her next-door neighbour to accompany her in one night of wild misdemeanor and witty revenge, he wondered how things would be changed between them at school next day. But Margo Roth Spiegelman never came back, leaving the only clues to her whereabouts in an old Bob Dylan poster and the poetry of Walt Whitman. Quentin and his friends search for her in paper towns and abandoned subdivisions, while Quentin tries to puzzle out who she is – this beautiful paper girl. 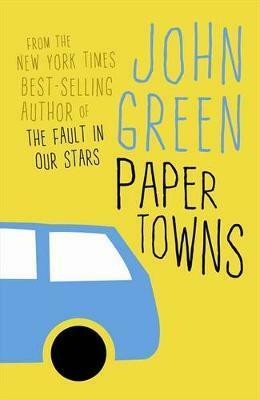 John Green has an ear for contemporary YA culture and the heart to affirm the myriad ways of living through it. An elusive story which invites close reading, though I also found it a compulsive holiday read.